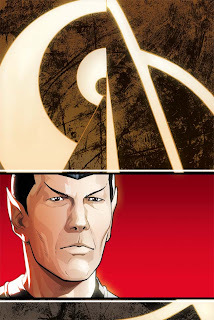 Since some people thought the "Hailing Frequencies" reference yesterday was going to lead to a STAR TREK mention, I figured I'd make up for that today by showing David Messina's cover to his coming STAR TREK: SPOCK: REFLECTIONS book, also being solicited for release in July. I'd call this Messina's follow-up to STAR TREK: COUNTDOWN if he hadn't already been doing ANGEL: SMILE TIME and working on another ANGEL miniseries. 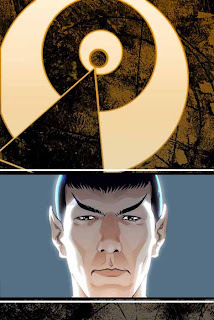 So let's call SPOCK *one of* his COUNTDOWN follow-ups (although it's set in the period just ahead of COUNTDOWN, and looks back over his entire life and career). It's written by Messina's frequent co-horts, Scott & David Tipton, too. And then there's that other "Messina STAR TREK: COUNTDOWN follow-up" project that we haven't announced yet. But more on that soon. So Chris - you mighta let the cat outta the bag - Messina is working on *another* Angel mini apart from Smile time? Another Angel mini series AND another Star Trek one - sounds very promising !!! Fantastic! Both covers look amazing. Looking forward to hearing about his next Trek project. The hint on the ANGEL mini is that it's an all-new thing and it spins out of ANGEL 23. And features two characters who aren't Angel; one of whom is black and the other of whom is (partly) blue. Which is a pretty extensive hint, now that I think about it. "The hint on the ANGEL mini is that it's an all-new thing and it spins out of ANGEL 23. And features two characters who aren't Angel; one of whom is black and the other of whom is (partly) blue." Gunn & Iliria YAY !!! BTW - when is the new Spike ongoing series is supposed to start ??? By the way: I'm the publisher of the German edition of Countdown and we invited David Messina over to Germany to attend Europes largest Sci-Fi-Convention. He's the most friendly guy and he spent 12 hours a day signing Countdown to please the fans. He also had some fun: He was up on stage with Nichelle Nicholls, Nana Visitor, Robert Picardo, Richard Hatch, Edward James Olmos and others. He's back in Rome now at the drawing board, so hopefully, we will see more of his new Star Trek titles soon.